Are you tired of going outside in the cold mornings, dark evenings, and pouring rain just to lock your chicken coop? If your chickens are smart enough to remain warm and dry in harsh weather, why shouldn’t you be? Investing in an automatic chicken coop door will give you peace of mind while you’re lying in bed at dawn, warm and snuggly, that your chickens are already outside getting the exercise that they need and deserve. And what about in the evening, when you’re sat comfortably in front of your favorite TV show? Well, your automatic chicken coop door will lock your precious chickens up safe and sound for you and won’t allow any predators get inside the coop. You certainly won’t lose your favorite hen to that pesky fox again once you’ve bought an automatic chicken coop door. Automatic chicken coop doors were designed with two main ideas in mind; the safety of the chickens, and the happiness of the owner. No more rushing home from a night out to make sure that your chickens are locked away, because the automatic chicken coop door will do it for you. You can purchase an automatic chicken door from a huge variety that is currently on the market, and in this article we will detail what we think are the best automatic chicken coop doors and why. For years people all over the world have battled with trying to stop predators such as foxes from killing their beloved chickens. Nothing is worse than waking up in the morning after falling asleep early and forgetting to lock your chicken coop, and coming outside to find your chicken coop looking like a murder scene from NCIS. Blood, smashed eggs and feathers everywhere. RIP chickens. But now, you don’t have to worry about a gruesome and gory murder of your favorite feathered friends, thanks to the creation of the automatic chicken coop door. Chickens love to dust-bathe, forage, and run around outside, so an automatic chicken coop door can provide your chickens with the freedom they desire alongside the safety that they need! It’s also important to keep your chickens happy with all of the supplies that they need, and we think that an automatic chicken coop door is a great supply to have. Our top pick on our list of amazing automatic chicken coop doors is the ChickenGuard Premium Automatic Chicken Coop Pop Door Opener & Door Kit Combo. This kit (it comes with a motor, remote, AND door; awesome!!) comes with the guarantee that you will not have to suffer anymore early wake ups, any more late night trips to the coop, installation of the door will be so easy that even your chickens could install it, and reliable chicken coop door opening or your money back. Wow, with guarantees like that, it’s hard not to consider this door for your chickens coop. Customers who have purchased this door have reported that it gave them peace of mind about the safety of their chickens, ducks, and other poultry animals. Next up on our list is the Automatic Chicken Coop Door Opener by Cheeper Keeper. This perfect contraption opens automatically at dawn and closes automatically at dusk. It also runs on AA batteries that will last for years! It’s weatherproof which is perfect for your precious chickens. The motor that controls the movement of the door is programmed to stop if the door becomes blocked (to prevent and door/chicken related injuries) and opens for 3 minutes at a time, giving your intelligent chickens plenty of time to come into the coop or go outside for a day of fun. This door is also easily installed, making your life a lot easier very quickly. Customers have been impressed with this product and said that it was very easy to install. The next product is the ASTx Extreme Automatic Chicken Coop Pop Door Opener by Chickenguard. This automatic chicken coop door has an integrated timer and LUX sensor so that you have full control of the door even when you’re not touching or near it. The door is manually controlled by a simple press of a button. This product only comes with the remote and motor to open the door, so you will need to build the door or attach the door to the motor yourself to the door that you have already. Don’t worry though! This automatic door opener is super easy to install and to attach to your door. So easy that even the least crafty, most clumsy person in the world could install it. Next up is the Brinsea Products Chick Safe Premium Automatic Chicken Coop Door Opener. This product is an attractive grey and yellow color combination that will really make your chicken coop pop. 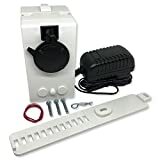 You will need to build the actual door yourself, or attach the motor to your existing door, but this product provides you with the motor and remote control to make your life 100x easier. This leaves the doors design down to you. You want a grey and yellow door to match the remote? Then why not?! Next up on our list of the Best Automatic Chicken Coop Doors is the Add-A-Motor Chicken Coop Automatic Motor (D20). This nifty little attachment easily attaches to any chicken coop door, no matter what the material, instantly making it automatic (and making your life 1000 times easier!). This motor has a customizable time schedule meaning that you can program your chicken coop door to open and close whenever you please. It also automatically stops at position that you pre-set; so if you want to leave the door open an inch or so in the warm summer months to maximize your chickens comfort then you can. The Add-A-Motor Chicken Coop Automatic Motor (D20) can also be bought for a steal compared to other similar products from many major online retailors! The next door is the ChickenGuard Automatic Chicken Coop Door Opener. This product is rated as one of the best automatic chicken coop door openers on the market. They offer a range of products from standard door openers, to premium door openers, to extreme door openers. They also sell door kits, where you are able to buy a brand new door for your chickens along with the door opener. Their products come with a 3 year warranty, 2 day shipping worldwide and a guarantee of an easy set up. Their website has instructions and a guide on which automatic chicken coop door opener could be best for you, as well as a set up video. Choosing and setting up your brand new automatic door has never been easier than this! Another automatic chicken coop door is the AutoCoop Advanced Chicken Coop Door Kit. This door is pretty much the same as every other chicken coop door on the market except it uses weatherproof fiberglass in its construction, so it looks really fancy and sophisticated as well as doing its primary job of opening and closing your chicken coop door everyday so that you don’t have to. I love this door because it looks so nice and it make my chickens feel like royalty (at least I think so anyway!). The final automatic chicken coop door that I will mention is the Coop Auto Door. This door comes ready to use and with guaranteed easy installation. This door has 3 operating modes; timer, manual, and override. The door is made from heavy aluminum which is 100% predator proof, and a composite frame that will not rust, rot, or warp. I like this door because in the cold winter months the aluminum and well-built frame help to keep the warmth inside my chicken coop, keeping my chickens nice and toasty against the harsh winter winds. Will the automatic chicken coop door harm my chicken? It is entirely possible that the machine can malfunction, and your chicken could get hit by the falling door as it passes in and out of its coop. However, the actual doors are so lightweight, it shouldn’t give your chicken more than a little fright if the door does close on them. How do I set the timer? 99.9999% of automatic chicken coop doors that you purchase will come with an instruction manual, detailing exactly how to do everything, including set the timer. What happens if I have a power cut? We recommend that you install a battery backup in the event of a power outage or power cut. If this does not work though, the door should be easy enough to open by hand. Are automatic chicken coop doors easy to install? The average person should be able to install a door for their chicken coop in 15 minutes or less. Use the information manual and instruction guide to help you, and your installation should be quick and easy! What other important supplies should I have for my chickens? Inside the coop, your chickens will also need some form of bedding to optimize their comfort. We recommend shavings such as pine, because they are cheap, easy for your chickens to kick around, and do a good job at soaking up droppings. You will also need water dishes, food dishes, food, and nesting boxes. What else can I give to my chicken to maximize its happiness? Something we suggest for backyard chickens is a chicken run. This can help to keep your chickens very safe from those pesky predators that we mentioned earlier. You can also make toys for your chickens. Chickens are incredibly intelligent and enjoy toys such as puzzle feeders or even a ball to kick around and chase. How long will my automatic chicken coop door last? This entirely depends on the warranty of the door and the quality of the door that you purchase. So the main question you need to ask yourself now is; if you are a bird owner and you don’t have an automatic door for your beloved poultry, then why not?! Not only d these doors keep your chickens safe and sound, they also make your life 100 times easier. So what are you waiting for? Start searching for your perfect automatic chicken coop door today!